※ Free baggage allowance of Spring Plus Fare and Spring Fare includes both Checked Baggage and Carry-on Baggage, and the Carry-on Baggage must not weigh over 7 kg. There is no free Checked Baggage for Lucky Spring Fare. · New booking fee, change, refund fee, various fees are required separately. Click HERE for details. · Seat Assignment Charge is required separately if you wish to assign seats. Click HERE for details. · A valid fare is applied at the time of making the reservation. However, if the payment has not been completed within the limited purchase time, the reservation will be invalid. · Infant fares (under 2 years old) are uniformly JPY 1,500 per section regardless of boarding day and section. Child fares (2 to 12 years old) apply to adult fares. Click HERE for details. · Lucky Spring fares are campaign fare for Internet reservation only. We will announce the start date via our homepage. Changes / Cancellation and Refunds will be charged as follows. ・Children fare apply to the adult fare rules. There is no charge for infants’ changes/cancellation and refunds. 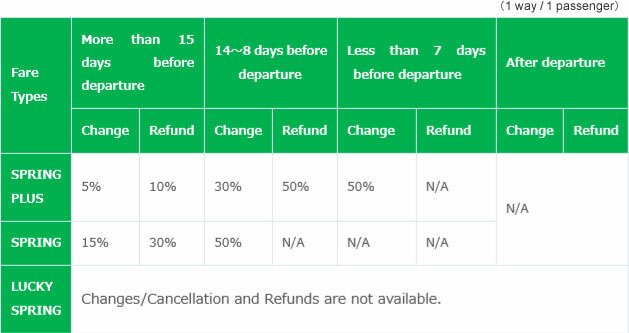 However, changes/cancellation and refunds are not available after departure time. Changes / Cancellation and Refunds depend on the applicable conditions of different fares. Please see HERE to confirm commission rates of different fares. ※ In the case of applying via Spring Japan Call Center, the procedure is limited within business hours. Even if it can be accepted base on fare rules, we cannot accept the procedure when it is out of Spring Japan Call Center business hours. · Changes are reserved with changeable fares, and subject to conditions and acceptance within acceptable time. · Changes will be handled at the window we reserved in principle. · Normally, Changes can only be corresponded through the same channel that you made the reservation. If you made the reservation via the Internet, please apply the changes via Internet. If you made the reservation via Call Center, please contact Call Center to apply for changes. · There are no restrictions on new boarding days. Changes are available to date of released ticket at the time of making changes. · Changes can only be made to the same fare as reserved fare or to a fare higher than that.Changes to the lower fare than the booked fare cannot be accepted. · When making the changes, Change Fee will apply to the different fare types, and the difference from different fares is required. · As a result of the changes, if the fare is higher than booked before, the difference additional amount is required. · Please make the payment of Change Fee and the difference additional amount within the limited time. · Passenger's name cannot be changed. In the case of passenger change, the passenger has to cancel the reservation once and purchase a new ticket. Correcting the spelling of passenger's name, will only be accepted once. In that case, the payment of Information Change Fee JPY 2,000 for correcting 1 place of either first name or last name (JPY 4,000 for both first name and last name) must be made. · Cancellation and Refunds are reserved with refundable fares, and subject to conditions and acceptance within acceptable time. · Option Service Charges are not refundable. In case of Cancellation and Refunds, ticket fares deduct the Refund Fee excluding the Option Service Charges will be refunded. · Option Service Charge, New Booking Fee, Payment Fee, Information Change and other Commission Fee are not refundable. · Normally, Cancellation and Refunds can only be corresponded through the same channel that you made the reservation. If you made the reservation by a travel agency, please contact the agency store. Please prepare the Reservation Confirmation, the Reservation Number and etc. that can confirm the reservation has been made. · In the case of refunding by bank transfer, the Bank Transfer Fee will be charged while making the payment transfer to the customer. · If the reservation has been made due to such as illness, a Medical Certificate written by your doctor is required. For more details on refund, please contact our Call Center. · The attendant of the passenger who is on the same reservation record, only 1 attendant’s refund will be accepted. For more details on refund, please contact the call center. · Please submit the Medical Certificate before departure. In case of not be able to submit the Medical Certificate before departure, please contact Spring Japan Call Center before departure. · Please be sure to tell your doctor that to write a reason why you are not be able to board the flight on the Medical Certificate. · For more details on refund, please contact the call center. In case of Delay / Cancellation due to force majeure such as storms and snowfalls, or significant delay or cancellation due to convenience of our company such as equipment improvement / equipment malfunction, we will respond as follows. · We will only accept the transfer to our own flights within 7 days before or after which have vacant seats. However, it is limited to the same section. · According to the Transfer, fare difference, change fee will be free. · If you wish to change the flight beyond 7 days, which apply the normal fare rules. ·The refund period is limited to 30 days from the boarding day. · Refund amount details are based on our company regulations. ·The refunds procedure will be made upon purchase payment method. ※In the case of credit card payment, refunds will be made via the same credit card company as purchase payment. · The reservations which have been made via Internet or Call Center, the Changes / Cancellation and Refunds procedure can be accepted through Call Center. ·Spring Japan will not be responsible for Transfer to other companies, accommodation and transportation expenses. · Depending on the seat vacancy situation, we may not be able to satisfy your aspiration. ·We will not be responsible for delays in ground transportation facilities or for failing to transit to or from another company's flight. · We will correspond through the same channel that you made the purchase. If you made the reservation through a travel agency, please contact the agency store where you made the purchase. 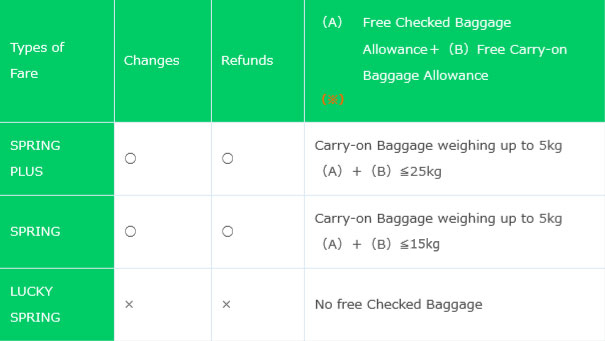 ※ Free baggage allowance of Spring Plus Fare and Spring Fare includes both Checked Baggage and Carry-on Baggage, and the Carry-on Baggage must not weigh over 5 kg. · Fuel Surcharge will be separately applied. · Fuel Surcharge depends on boarding section. · Taxes, fees and option charges will be applied separately according to the specified destination and itinerary. · The specific amount will be displayed during the booking process and will be added to the total price. · Customers under the age of 16 are not allowed to board alone. · Infant fares (under 2 years old) are uniformly JPY 3,000 per section regardless of boarding day and section. Child fares (2 to 12 years old) apply to adult fares. Click HERE for details. · Changes are possible only within the validity period of the tickets. · Changes can only be made to the same fare as reserved fare or to a fare higher than that. · Seat assignment purchase cannot be changed · refunded. · Please make the payment of Change Fee and the Fare Difference within the deadline. · Passenger's name cannot be changed. · Refunds will be calculated as the same method and same currency upon your purchase method. In the case of credit card payment, refunds will be made via the same credit card account as purchase payment. · In the case of bank transfer payment, transfer fee / refund fee will be customer burden. Please contact Spring Japan Call Center. · We will only accept the transfer to our own flights within 7 days before or after which have vacant seats. However, it is limited to the same section. · According to the Transfer, fare difference, change fee will be free. ·Ticket fare will be fully refunded. However, it does not exceed the total amount of payment has been paid. · Refunds will be calculated as the same method and same currency upon your purchase method. ※In the case of credit card payment, refunds will be made via the same credit card account as purchase payment.